Note that UPS will not ship over 8 feet. When ordering you can specify cut 5′ and balance, 6′ and balance, 7′ and balance, etc. On larger orders we normally ship by truck and cutting the lengths is not necessary. Frames are cut to your specifications with mitred corners. Unless specified all frames will have an 1/8" allowance. This option will require you to have the tools, equipment, time and expertise to join your own frames. The frame comes to you unjoined, but the mitres have been routed out from behind with a special machine. You glue the corners and insert a plastic wedge and use a hammer to insert it into the prerouted slot. This system will allow you to adjust the corners until they are aligned. See our video below for step by step instructions on how to join frames with our wedge system. We recommend this option when you are on a budget and have the time and patience to join your own frames. Shipping costs will be substantially reduced when ordering large or oversize frames. 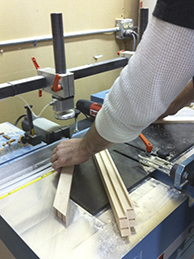 Frames are cut to your specifications, glued, and joined with our wedge system from behind so there are no visible nail holes. 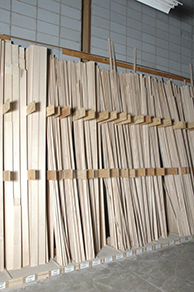 All frames are then touched up and sanded before they are finished to ensure the highest level of quality. We recommend this option when museum quality frames are required for your exhibition. Frames are joined with wedges and splines and then touched up and sanded before they are finished to ensure the highest level of quality. 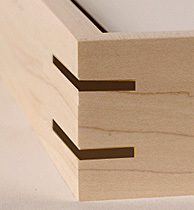 Spline joints add additional strength and beauty. Because the spline joint offers a larger glue area, the joint becomes very strong. Matching splines use the same wood as the frame. 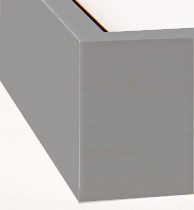 Spline joints are required with painted white, black and graphite frames to add stability to their seamless corners. 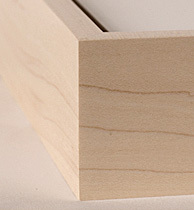 We recommend this option to add strength to the corners of larger, thinner, and painted white, black and graphite frames. With the painted finishes they will not be visible. Frames are joined with wedges and splines and then touched up and sanded before they are finished to ensure the highest level of quality. Contrasting splines use a darker wood to contrast with the frame adding a decorative effect to the frame. Because the spline joint offers a larger glue area, the joint becomes very strong. We recommend this option when you want an added detail on the frame corners and to add strength to the corners of larger, thinner, frames. 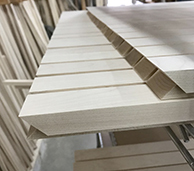 On our painted frames we first join them with our wedge system (except on our ultra thin frames which are too thin for wedges) and if necessary we add spline joints which offers a larger glue area making the corner joint much stronger on thin or large frames. 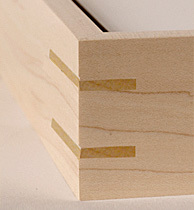 Because the finish is opaque the spline joints will not be visible.